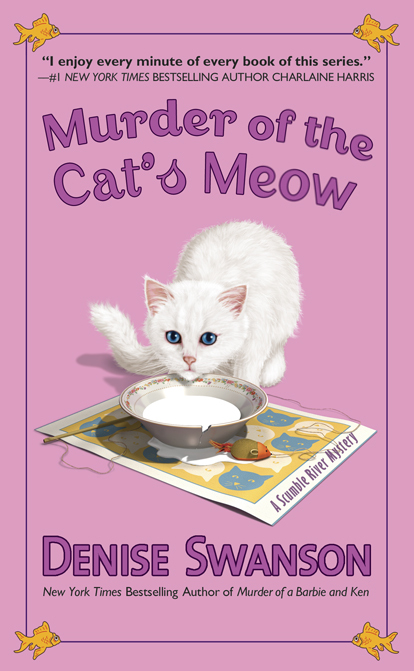 Skye Denison from Denise Swanson’s New York Times bestselling Scumble River mystery series talks about her life and adventures. Hi! My name is Skye Denison. I’m a school psychologist in Scumble River, a small town in Central Illinois. Although I was born and raised in Scumble River, I left as soon as I turned eighteen and stayed away until I was nearly thirty. I’ve been back six years, and have come to realize that Scumble River is indeed home. My life seems to be getting busier and busier. After solving the mystery of who killed the cat show judge, I started planning my wedding. I knew my mother would drive me crazy, but I wasn’t prepared for the rest of the town to join her in her quest. My fiancé and I wanted a small wedding, but I soon realized that just wasn’t going to happen. Now I’m just concentrating on making sure Mom doesn’t turn the whole affair into a three-ring circus. Ever since my California cousin’s over-the-top platinum wedding, Mom has been plotting how to make mine even bigger and splashier. I nixed the fireworks and the hiring the Chicago Symphony Orchestra, but I sort of like the idea of the horse drawn sleigh. Especially, since I’m getting married right after Christmas. Now I just have to convince my mother that I’m not going on a strict diet in order to fit into her size 6 wedding dress. In addition to the usual bridal craziness, I’m still trying to cleanse my house of the previous owner’s spirit. The first attempt went painfully wrong and now I have a ticked off ghost to deal with. I’ve decided to let her be and see if she calms down. Maybe once I’m married she’ll be happy since it seems what really riles her is if I attempt to you know what. I’m hoping that once we’re blessed by both the church and state her sense of right will be satisfied. In addition to ghosts and wedding plans, there’s my job, which brings its own challenges. Anyone who thinks a small town school district doesn’t have as many problems as a city or suburban school district has never worked in one. The issues may be different, but they’re still there. 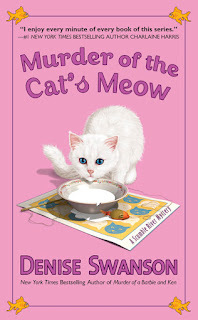 If you’re interested in my life, my biographer, Denise Swanson, has written about my latest adventure in a book called Murder of the Cat’s Meow. Fireworks! The Chicago Symphony Orchestra! What good ideas! Maybe that's what the ghost wants you to do. Skye, my sister went through similar problems when she got married -- the third time. It sounds like you're being quite reasonable for a bride. Hope things work out better for you than they did for my sister! I LOVE the idea of a Christmas wedding and a horse-drawn sleigh. Hold out for what *you* want!! Thanks, Edna, Krista, and Victoria!